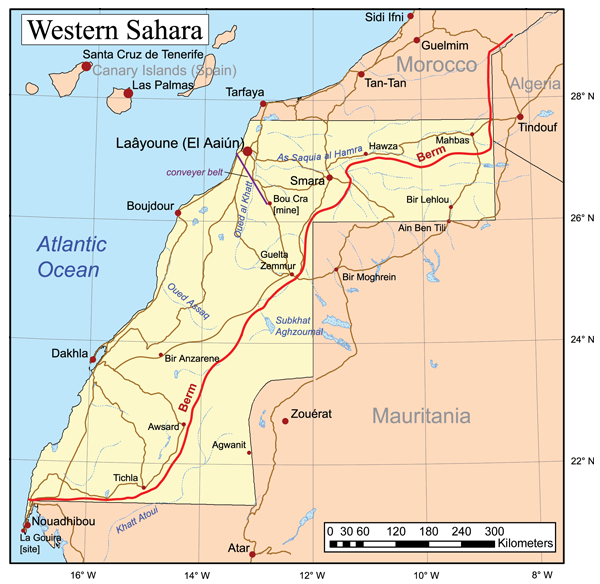 Western Sahara (/ˌwɛs.tərn səˈhɑː.rə, -ˈhɛərə, -ˈhærə/; Arabic: الصحراء الغربية‎‎ aṣ-Ṣaḥrā’ al-Gharbīyah; Berber: Taneẓroft Tutrimt) is a country in the Maghreb region of North Africa, bordered by Morocco to the north, Algeria to the northeast, Mauritania to the east and south, and the Atlantic Ocean to the west. Its surface area amounts to 266,000 square kilometres (103,000 sq mi). It is one of the most sparsely populated territories in the world, mainly consisting of desert flatlands. The population is estimated at just over 500,000, of which nearly 40% live in Laayoune, the largest city in Western Sahara.